Did you know that having your home or business air sealed can save you hundreds to thousands of dollars each year on energy costs? At Delmarva Insulation, we provide comprehensive air sealing to clients throughout all of Delaware. Read on to learn more about air sealing, and give our insulation team a call at (302) 854-0344 for more information. Air sealing prevents airflow between the interior and exterior of a building. Proper air sealing helps heated and cooled air stay inside the building by closing the gaps that leak air. Think of air sealing like closing a window before running air conditioning – why condition the interior air if you are going to let it sneak out through a gap in your home’s envelope? By sealing airflow in your Delaware home or business, you are increasing energy efficiency, thereby lowering energy costs and saving money. Foam Insulation: Spray foam insulation functions as an air sealant and an insulator in one. With one pass, a cavity can have air leaks sealed and R-value added. Spray foam may be right for your project. Contact our insulation professionals to learn more. Caulking: Caulking is a type of air sealing that uses a synthetic, flexible material called caulk to seal stationary gaps less than 1 quarter-inch wide. 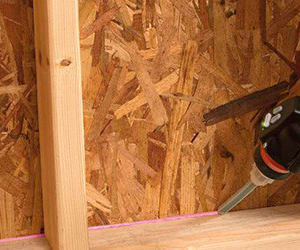 Caulk is used most often in combination with fiberglass insulation projects. There are several types of caulk that each have unique advantages depending on the sealing job required. Contact our spray foam installers to learn more. Weatherstripping: Weatherstripping is a type of air sealing that uses materials such as solid foam, felt, vinyl or metal to seal gaps of varied thickness. Unlike caulking, weatherstripping is best used on movable objects such as doors and windows. Basements: For many homes, the basement is the area where most cold air leakage from the outside occurs. Cold air can seep in around the foundation, around boxsills and around windows in a home’s basement. Adding basement insulation and getting these areas sealed will help your home retain heat during winter months. Top Plates: If you are remodeling your home or building a new home, we recommend insulating top plates. A top plate is also known as the upper wall plate or ceiling plate and isn’t something that can be seen or accessed in an existing home. Top plates are horizontal boards that attach walls to the ceiling or attach the first floor to an upper floor. During construction, home builders will typically leave a small amount of space between top plates and drywall to leave room for thermal expansion and contraction. Often, this space is never filled and air moves freely. By sealing top plates, you can reduce air transfer from conditioned living space to unconditioned attic space. Your home may have leaks that are easily spotted though a visual inspection. It likely also has many other holes in its envelope that can’t be easily seen. These air leaks are found around light boxes, plumbing stacks, soffit drops, basement box sills and more. Having your home inspected and air sealed by our experienced air sealing insulation contractors at Delmarva Insulation will give you the most comprehensive sealing available anywhere in Delaware. Since 2002, we have been providing high quality air sealing services to homes and businesses across the region. If you are interested in learning more about air sealing, our experienced insulation contractors will be happy to help. If you are looking for insulation companies, please contact us and we’ll connect you with somebody who can answer your questions.